Cheeks The Toy Wonder makes his return in this darker than usual holiday special. 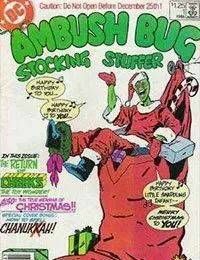 Not only darker for a Christmas book, but dark for the Ambush Bug. Not only does Cheeks the Wonder Toy return, but he does so as a cannabalistic zombie. As the city notices stuffed animals and dolls everywhere are viciously attacked and eaten, it is the Night of the Living Dolls. Also a whole lot of one page gas.<br />And a promise of a showdown between Ambush Bug and the Joker.